Publishing the best books from past and present to entertain, educate and inspire. The author known as Mark Twain was born Samuel Clemens in Florida Missouri on Nov. 30, 1835. He was the sixth of seven children and as a small child moved with his family to the small, frontier town of Hannibal, Missouri where his father and uncle had farms including slave’s quarters, as Missouri was a slave state. The experience of playing with slave children and visiting in their homes to listen to stories told affected the young Sam the rest of his life and is evident throughout many of his stories. The American Civil War broke out in 1861, but after just two week in a Confederate unit, Clemens decided to head west to join his brother, Orion, who been appointed Secretary of the Nevada Territory. So, along with many others, he headed for the adventure of the Nevada silver mines, traveling across the American frontier by stagecoach. His first venture West, he experienced the landscape, the hardships of long travel over rough roads, and the meeting of Native Americans for the first time. Clemens tried his hand as a silver prospect minor with no success. He turned then to writing for the Territorial Enterprise newspaper in Virginia City, Nevada. This is where the pen name of “Mark Twain” was born. In 1864, Clemens decided to try San Francisco and left the rural countryside of Virginia City (see Virginia City, NV in the early 1900s ) for more civilized surroundings. Here he got his first publishing success in 1865 with his now famous short story, “Jim Smiley and His Jumping Frog” which was published in papers across the country. A year later, Sam was hired by the Sacramento Union to visit and report on the Sandwich Islands (now Hawaii). In 1867, Clemens headed East again to New York City to write articles from there for the Alta California newspaper. He then traveled to Europe and on to Jerusalem, all the while sending travel letters back to the newspaper for publication. On this trip, Clemens was shown a picture of Olivia Langdon by her traveling brother and Samuel Clemens fell in love at first sight and was later married to Olivia in 1870 after a few years of courting and convincing her that he was her husband to be. The married Clemens settled in Buffalo, New York ( see Buffalo, NY in the early 1900s ) where Sam became the editor and partner of the Buffalo Express. Later, the Clemens family moved to Connecticut where he continued to write and lecture for many years and raise their three children. From 1891 until 1900, Sam and his family traveled throughout the world. In 1903, after living in New York City for three years, Livy became ill and Sam and his wife returned to Italy where she died a year later. After her death, Sam lived in New York until 1908 when he moved into his last house, “Stormfield”, in Redding, Connecticut. On April 21, 1910, Sam Clemens died at the age of 74 in Redding, Connecticut. Samuel Clemens, known as Mark Twain spent his life commenting on all that he observed around him both personally, in politics, and in society. His writings are woven with a combination of sarcasm against the cruelty and evils of the world, awe at the beautiful and innocent, and humor upon the ridiculous. 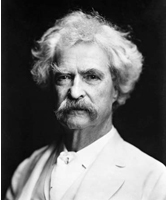 Mark Twain is known by most for his books, The Adventures of Huckleberry Finn and The Adventures of Tom Sawyer. And, most of you probably also grew up watching various versions of these made into movies. However, many people do not not know about his book, Personal Recollections of Joan of Arc. ARose Books decided to publish this book at the prompting of a friend. Apparently, St. Jeanne D’ Arc (Joan of Arc) was one of the few people in all of history that Mark Twain actually respected. In his own words, she was his “hero.” Twain actually spent twelve years researching the history of the Middle Ages and went to France to study the documents describing the trial of Jeanne D’ Arc then wrote the book, Personal Recollections of Joan of Arc. Below are a list of Mark Twain’s novels and movies made from these novels and his short stories. Copyright © 2002 – 2018 ARose Books Publishing Company. All rights reserved.